Cell therapy regimens are frequently compromised by low-efficiency cell homing to therapeutic niches. Improvements in this regard would enhance effectiveness of clinically applicable cell therapy. The major regulators of tissue-specific cellular migration are chemokines, and therefore selection of therapeutic cellular populations for appropriate chemokine receptor expression would enhance tissue-homing competence. A number of practical considerations preclude the use of Abs in this context, and alternative approaches are required. In this study, we demonstrate that appropriately labeled chemokines are at least as effective in detecting their cognate receptors as commercially available Abs. We also demonstrate the utility of biotinylated chemokines as cell-sorting reagents. Specifically, we demonstrate, in the context of CCR7 (essential for lymph node homing of leukocytes), the ability of biotinylated CCL19 with magnetic bead sorting to enrich for CCR7-expressing cells. The sorted cells demonstrate improved CCR7 responsiveness and lymph node–homing capability, and the sorting is effective for both T cells and dendritic cells. Importantly, the ability of chemokines to detect CCR7, and sort for CCR7 positivity, crosses species being effective on murine and human cells. This novel approach to cell sorting is therefore inexpensive, versatile, and applicable to numerous cell therapy contexts. We propose that this represents a significant technological advance with important therapeutic implications. Leukocyte migration is regulated by chemokines that possess a characteristic conserved cysteine motif (1–3) and interact with G protein–coupled receptors (4). To date, ∼45 chemokines and 18 receptors have been identified. Chemokine biology can be simplified by defining them as being inflammatory, or homeostatic, according to the contexts in which they function (2, 5). Thus, inflammatory chemokines control leukocyte migration to inflamed sites throughout the body, whereas homeostatic chemokines regulate basal leukocyte trafficking to specific tissues and tissue compartments. It is now clear that cells carry address codes specifying tissue-specific migratory capacity, and key components of cellular address codes are receptors for homeostatic chemokines (6). Notably, this aspect of regulation of cellular migration is rarely considered in current cell therapy regimens, which frequently require tissue-specific targeting of therapeutic cells for effective clinical outcome. Accordingly, cells used for therapy invariably display heterogeneous expression of appropriate homing chemokine receptors that contributes to the inefficient migration of these cells to their therapeutic niche (7–10). The best example of chemokine-dependent tissue-specific migration, and one of importance to cellular therapy, is the role for CCL19 and CCL21, and their cognate receptor CCR7, in specifying cell migration to lymph nodes (LNs) (11–14). Thus, APCs, such as dendritic cells (DCs), following Ag encounter at infected/inflamed sites, upregulate CCR7, which supports their migration to LNs (15–18). Naive and central memory T cells also express CCR7, which specifically marks a population requiring transit to LNs for effector function. The importance of CCR7 for LN migration of DCs and T cells is supported by numerous studies with CCR7-deficient mice (13). Thus, CCR7 is essential for cell migration to LNs and the development of adaptive immune responses and tolerance. In cellular therapies, therapeutic DCs and T cells typically display varied CCR7 expression levels (19). As a result, much of the lack of success of DC, and T cell, immunotherapy has been attributed to poor cellular homing to LNs compounded by possible tolerance induction by immature CCR7− DCs (20, 21). A number of approaches have been developed to try to overcome this, including direct intralymphatic injection of DCs, intranodal injection (22), adenoviral overexpression of CCR7 (23), and trogocytosis (24). Each of these approaches has disadvantages and is of limited clinical use. It is clear that new insights are required to improve therapeutic cell homing in these, and other, cell therapy contexts. We present a novel approach to this problem involving the use of biotinylated chemokines to enrich for cells bearing their cognate receptors. Such technology is important given the dearth of high-quality Abs to many chemokine receptors, along with the expense, and other considerations, associated with production of Abs for clinical cell sorting. The approach described has numerous other advantages, including the ability to chemically synthesize biotinylated chemokines to complete purity at relatively low cost and (given the conservation of chemokines) the ability to use biotinylated human chemokines in both human and veterinary clinical and experimental contexts. Specifically, we demonstrate the ability of biotinylated CCL19 (bCCL19) to detect, and enrich for, CCR7-expressing T cells and DCs. We further demonstrate that bCCL19-sorted T cells and DCs are fully functional, displaying heightened responses to CCR7 ligands, and that the DCs have enhanced LN-homing capacity. They are therefore likely to represent improved cellular products for immunotherapy. The requirement for specific chemokine receptors in other tissue-specific cellular therapy contexts means that the approaches described will be of broad clinical applicability. Overall, we conclude that the use of chemokines as novel cell-sorting agents is simple, inexpensive, versatile, and ideally suited to clinical development. Human buffy coats were obtained from Scottish National Blood Transfusion Service (approved by Glasgow National Health Service Trust-East Ethics Committee). PBMC were isolated using Ficoll-Paque gradient (GE Healthcare). Short-term polyclonal cultures of human T cells were generated exactly as previously described (25). CD14+ monocytes were isolated using magnetic bead separation (Miltenyi Biotec), as per manufacturer’s instructions. Immature DCs were generated, as described (26), and matured by replating 0.5 × 106 cells/ml in complete medium with addition of 20 μg/ml polyinosinic-polycytidylic and 1 μg/ml PGE2 (both from Sigma-Aldrich) for 48 h (27). HEK cells were cultured and transfected with D6 and CCR7, as described (28–30), and binding and internalization assays were performed, as previously reported (31–33). C57BL/6 D6-deficient mice and WT C57BL/6 mice with Ly5.2, Ly5.1, and Ly5.1/5.2 heterozygous expression were maintained in the Glasgow University Biological Services Facility under specific pathogen-free conditions. All experiments were conducted under the auspices of a United Kingdom Home Office License and approved by the University of Glasgow Ethical Review Committee. Mouse bone marrow (BM) cells were flushed from femurs and tibias and plated at 106 cells/ml in RPMI 1640 (Invitrogen) supplemented with 10% FCS (PAA), l-glutamine (2 mM), penicillin (100 U/ml), streptomycin (100 μg/ml; Sigma-Aldrich), and 20 ng/ml murine rGM-CSF (Peprotech) for 7 d. Nonadherent cells were replated, and medium was supplemented on days 2 and 4. On day 7, cells were replated at 106 cells/ml and matured with 100 ng/ml ultrapure LPS (Source Bioscience) and 50 ng/ml murine rTNF-α (Peprotech) for 24 h.
Abs used are listed in Table I. Dead cell exclusion was performed using DRAQ7 (Biostatus). Flow cytometric data were acquired using the MACSQuant flow cytometer and analyzed using MACSQuantify version 2.4 software (Miltenyi Biotec). As chemokines are relatively small proteins (65–80 aa), they can be generated by total chemical synthesis and site-specifically labeled during this process. For all the biotinylated chemokine proteins used in this study, the biotin moieties were added to a lysine residue introduced at the extreme C terminus of the proteins. All chemokine synthesis was performed by Almac Sciences (Edinburgh, Scotland). Cells were resuspended in buffer, and 100 μL/well was aliquoted into round-bottom 96-well plates. CCL17–PE-conjugated streptavidin (SAPE) or Alexa Fluor 647-labeled CCL22 was added to appropriate wells at a final concentration of 600 ng/ml. For the competition assay, 20-fold excess unlabeled CCL22 was added to wells containing CCL17-SAPE. For surface staining/chemokine uptake assays, cells were incubated at either 4°C or 37°C for 30 or 60 min. For competition assay, cells were incubated at 37°C for 60 min. To prevent adherence of cells, samples were agitated every 20 min by gentle pipetting. Cells were washed and labeled with 1 μL DRAQ7 dead cell discriminator prior to flow cytometric analysis. Both murine and human cell staining was performed in 0.5% media-grade BSA (Millipore) and 2 mM EDTA (Ambion) in PBS (Invitrogen) (PEB buffer). Single bCCL19, biotinylated CCL17, biotinylated CXCL12, double-biotinylated CCL19, native CCL22, and Alexa Fluor 647–labeled CCL22 were generated by chemical synthesis, as described above (Almac Sciences), and used to label target cells. Initial experiments were conducted using bCCL19. This was either added directly to cells, which were then washed, and bCCL19 detected with SAPE (Invitrogen; final concentration 10 μg/ml) or bCCL19 was detected using PE-labeled anti-biotin Ab, or was precomplexed to SAPE (10 μg/ml) by incubating the indicated concentrations at 4°C for 30 min. For all other cell staining using biotinylated chemokines, including uptake, the chemokine was precomplexed with SAPE at 4°C for 30 min. Cells were resuspended at 106 cells/test in a volume of 100 μL. Single-cell suspensions of thymocytes for CCL17-SAPE experiments were obtained from D6-deficient mice by passing the thymus through a 100-μm filter. Murine BM cells for CXCL12-SAPE staining were obtained by flushing BM from the femur and tibia of mice and performing red cell lysis (Miltenyi Biotec). Human and mouse DCs were preincubated with human or mouse FcR block (Miltenyi Biotec), respectively, for 5 min prior to Ab staining. Ab staining for cell surface lineage markers was performed at 4°C for 10 min. In all experiments, cells were then washed with PEB and labeled with 1 μL DRAQ7 dead cell discriminator prior to flow cytometric analysis. Cells were washed and resuspended in PEB at a maximal concentration of 107 cells/100 μl. Cells were incubated at 4°C with indicated concentrations of bCCL19 conjugated to SAPE (final concentration 50 μg/ml SAPE) for 30 min (unless otherwise stated). Murine BM-DCs were FcR blocked prior to addition of bCCL19-SAPE, as before. Cells were washed with PEB, stained with anti-PE microbeads (Miltenyi Biotec, as per manufacturer’s instructions), and isolated using MACS-LS columns at room temperature in ice-cold buffer. T cell proliferation was measured, as previously described (34), with minor modifications. Cells were resuspended in PBS and incubated with 1 μM CFSE (final concentration) for 10 min at 37°C, before quenching with complete medium on ice for 10 min. Cells were washed twice in complete medium before replating with either 20 U/ml IL-2 alone or 20 U/ml IL-2 plus T cell activation/expansion beads (Miltenyi Biotec, as per manufacturer’s instructions) for up to 5 d and fed using complete medium plus IL-2 (20 U/ml) on day 3. Cells were plated in six replicate wells, and proliferation was measured daily from a fresh well using the MACSQuant Analyzer and MACSQuantify version 2.4 software. For Transwell assays (3-μm–pore Transwell plates; Fisher Scientific), cells were washed and incubated for 1 h at 37°C in chemotaxis buffer (RPMI 1640/0.5% BSA). Chemotaxis buffer (600 μl) was added to the bottom of each well and incubated at 37°C for 10 min before being aspirated and replaced with dilutions of unlabeled CCL19 (0, 10, 100, and 500 ng/ml; Miltenyi Biotec) in chemotaxis buffer, and the Transwell membranes were inserted into each well (10 min, 37°C). T cell suspensions (100 μl containing 5 × 105 cells) were added to the inserts in each well and incubated for 3 h at 37°C. The inserts were then removed, the lower chamber was aspirated, and the cells were labeled with DRAQ7 and counted using the MACSQuant Analyzer and MACSQuantify version 2.4 software. Datawere expressed as a migration index, calculated as (individual count for each replicate)/(average background migration). Both Ly5.1- and Ly5.2-matured BM-DCs were stained with bCCL19-SAPE complex as for sorting, but only Ly5.1 cells were enriched into a >95% CCR7+ population. Equal numbers (7 × 105) of sorted Ly5.1 and unsorted Ly5.2 cells were mixed 1:1 in PBS/0.5% BSA and injected into the right footpad of Ly5.1/Ly5.2 heterozygous mice. At 48 h postinjection, draining popliteal LNs were removed and dissociated in HBSS with Blendzyme Liberase DL (0.84 Wünsch U/ml, as per manufacturer’s instructions; Roche). LN cells were passed through a 40-μm filter, stained with Ly5.1 and Ly5.2 Abs, and analyzed by flow cytometry. Single Ly5.1+- and Ly5.2+-expressing DCs were detected against the background level of endogenous Ly5.1+/Ly5.2+ DC. A reciprocal experiment was also performed, with Ly5.1 cells left unsorted and Ly5.2 enriched for CCR7+ cells. Statistical analysis used GraphPad Prism version 5.03 software, with specific tests detailed in Results. The p values <0.05 were considered statistically significant. In initial experiments, we examined the ability of biotinylated CCL17 (binds to CCR4 and D6) (35) and biotinylated CXCL12 (binds to CXCR4 and CXCR7) (36), in comparison with commercially available Abs (Table I), to detect their cognate receptors on primary cells. As shown (Fig. 1A), in comparison with isotype controls or anti-human CCR4 Abs, anti-mouse CCR4 Abs detected CCR4 expression in murine thymocytes (11.99%). 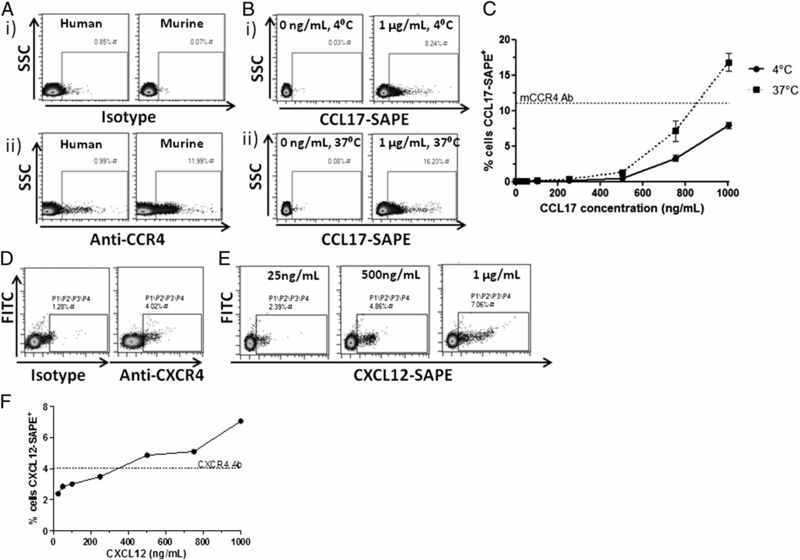 Importantly, SAPE-conjugated CCL17 detected CCR4 at levels equivalent to those detected by the Ab. CCR4 detection by biotinylated CCL17 was optimal at 37°C (16.23%) but still detectable at 4°C (8.24%) (Fig. 1B, 1C). The thymocytes used were from D6-deficient mice. Therefore, the only receptor that CCL17 is capable of interacting with is CCR4. These data demonstrate that SAPE-conjugated biotinylated CCL17 can detect CCR4 on primary murine thymocytes. Labeled chemokines as receptor detection agents. (A) CCR4 expression on thymocytes. Thymocytes from D6KO mice were labeled with either relevant isotype controls (Ai) or anti-human or anti-mouse CCR4 Abs (Aii). (B) CCR4 detection was enhanced at 37°C (Bii) compared with 4°C (Bi). (C) Incubating the cells with an increasing concentration of CCL17-SAPE complex showed that, at 37°C, the chemokine was able to label CCR4+ cells as well as, if not better than, species-specific Ab. n = 3, mean ± SEM. (D) CXCR4 expression on BM cells. Cells flushed from murine BM were stained with either anti-CXCR4 Ab or isotype to compare levels of CXCR4 detection. (E) CXCR4 detection at 37°C increased with increasing concentration of CXCL12-SAPE. (F) At concentrations >500 ng/ml, CXCL12-SAPE gives superior staining of CXCR4+ cells than the commercially available Ab. CXCR4 is involved in stem cell migration and function. Anti-murine CXCR4 Abs detected CXCR4 expression on ∼4% of total BM cells (Fig. 1D). As shown (Fig. 1E), SAPE-conjugated biotinylated CXCL12 was at least as good as, and potentially superior to, the Ab used at detecting CXCR4 in total murine BM cells (7.06 versus 4.02%) (Fig. 1E, 1F). Finally, we examined ability of labeled chemokines to detect receptors on heterologous transfectants. D6 binds both CCL17 and CCL22 (29, 32, 33). As shown (Supplemental Fig. 1A), SAPE-conjugated biotinylated CCL17, as well as Alexa Fluor–labeled CCL22, were both able to detect identical levels of D6 positivity (76%) in transfected HEK cells at a relatively low concentration of chemokine (<100 ng/ml; Supplemental Fig. 1B), and the two chemokines were able to cross compete on this receptor (Supplemental Fig. 1C). Thus, chemokines have utility as versatile, receptor-specific, detection agents for use in flow cytometric detection of chemokine receptors on primary cells and heterologous transfectants. In this regard, labeled chemokines are at least as effective as the commercially available Abs used. To determine the value of biotinylated chemokines for detecting CCR7-expressing cells, which are of significant cellular therapeutic interest, we generated human bCCL19. To test the ability of bCCL19 to functionally interact with CCR7, we measured its binding to, and internalization by, CCR7-expressing HEK cells. As shown (Fig. 2Ai), bCCL19 precomplexed with SAPE (bCCL19-SAPE) displayed minimal nonspecific binding and uptake by untransfected HEK, but did bind to, and was internalized by, CCR7-transfected HEK cells. This was competed out by unlabeled human CCL19 (Fig. 2Aii). 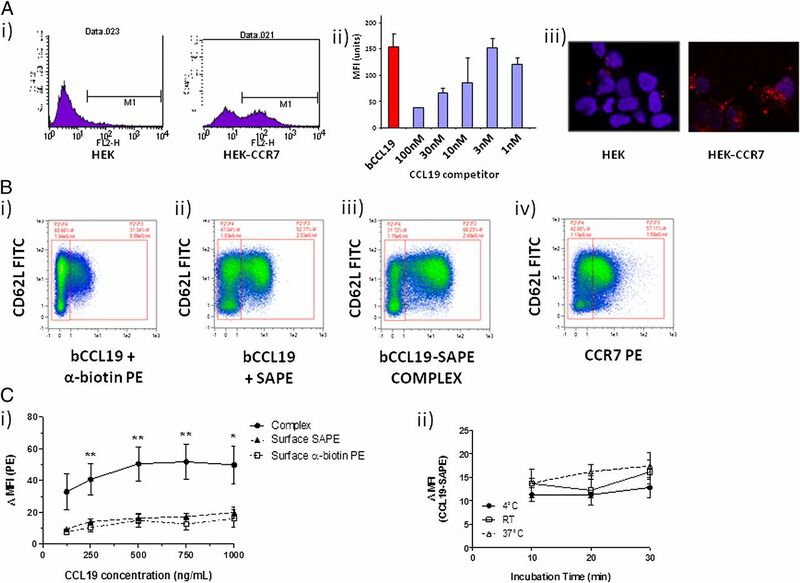 bCCL19 was internalized into cytoplasmic vesicles in CCR7-expressing HEK cells (but not untransfected HEK cells) following receptor interaction (Fig. 2Aiii). These results confirm that bCCL19 is active in terms of CCR7 binding and internalization. bCCL19 can detect CCR7 on T cells using flow cytometry. (Ai) Representative flow cytometric data showing the binding of the SAPE-tagged bCCL19 to HEK cells transfected with CCR7 (HEK-CCR7) but not to untransfected HEK cells (HEK). (Aii) The binding of bCCL19 to HEK-CCR7 cells is competable with unlabeled CCL19 (concentrations in nM). (Aiii) Confocal imaging demonstrating the uptake of PE-tagged bCCL19 into intracellular vesicles in HEK-CCR7, but not HEK, cells. All of the above experiments were performed at 37°C. (Bi–iv) Representative dot plots of T cells stained with the following: (Bi) bCCL19 followed by antibiotin-PE Ab; (Bii) bCCL19 followed by SAPE; (Biii) precomplexed bCCL19-SAPE; (Biv) CCR7-PE Ab. Plots taken from one donor with 250 ng/ml bCCL19 used for staining, with gating to indicate positive and negative populations. (C) Optimization of staining protocol using human T cells. (Ci) T cells were stained using either precomplexed bCCL19-SAPE (circles), or with bCCL19 alone, followed by surface staining with either SAPE (triangles) or anti-biotin PE (squares) (n = 4 different donors; data represent mean ± SEM, one-way ANOVA , p = 0.1. , **p = 0.0056. , **p = 0.0076. , **p = 0.0059. , *p = 0.025). Data are expressed as Δ mean fluorescence intensity (MFI), which was calculated as (MFI of CCR7/CD62L-positive population)/(MFI of CCR7/CD62L-negative population). (Cii) T cells were incubated with 250 ng/ml CCL19-SAPE complex at three different temperatures for increasing lengths of time to determine effects on staining, as described above (n = 2 different donors). To investigate the usefulness of bCCL19 as a flow cytometric marker for CCR7 on leukocytes, we stained human T cells of mixed CCR7 positivity, with bCCL19 in combination with various secondary detection agents. Controls showing no nonspecific binding of secondary detection agents to leukocytes are presented in Supplemental Fig. 2. As shown in Fig. 2Bi, whereas bCCL19 and PE-labeled anti-biotin Ab resulted in modest CCR7 staining on T cells (31.34%), bCCL19 staining followed by SAPE-based detection enhanced staining (52.17%) (Fig. 2Bii), suggesting that streptavidin-based tetramerization improves CCR7 detection by bCCL19. This was further enhanced (to 66.23%) by precomplexing bCCL19 and SAPE prior to addition to T cells (Fig. 2Biii). Flow cytometric staining using the bCCL19-SAPE complex was consistently 10-fold stronger than that seen with a commercially available PE-labeled anti-CCR7 Ab (Fig. 2Biv). Notably, the percentage of T cells detected as being CCR7+ was similar, suggesting that bCCL19 and anti-CCR7 were identifying the same cell population. To optimize the staining protocol (Fig. 2C), we performed dose-response studies, which confirm that precomplexing gave the strongest staining, which was maximal at 250–500 ng/ml bCCL19 (Fig. 2Ci). Importantly, neither incubation time (10–30 min) nor temperature (4°C or 37°C) had a significant impact on CCR7 staining with bCCL19-SAPE (Fig. 2Cii). 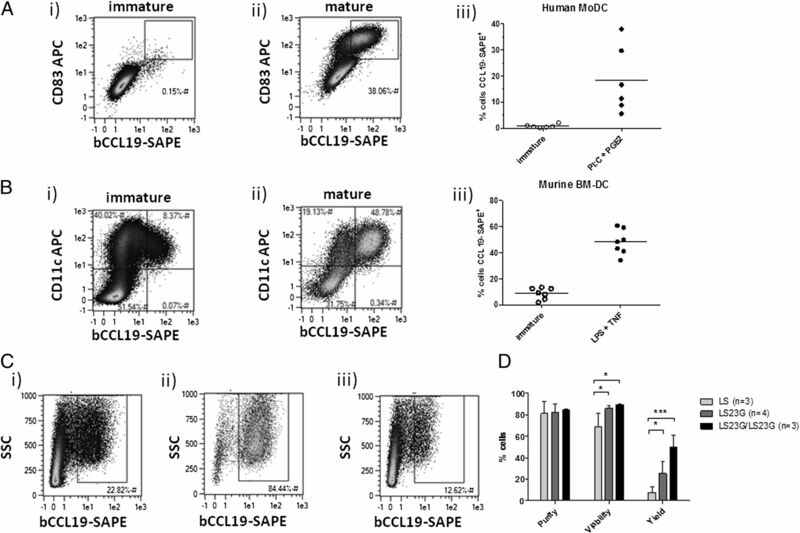 Therefore, these flow cytometric data indicate that SAPE-conjugated bCCL19 represents an efficient reagent for CCR7 detection on human T cells. We next investigated the possibility that bCCL19-SAPE tetramers, with anti-PE magnetic microbeads, could be used to sort CCR7+ T cells. To this end, we sorted T cells using 250 ng/ml SAPE-conjugated bCCL19, according to the protocol outlined in Fig. 3A. As shown (Fig. 3Bi, 3Bii), this protocol enriched for CCR7 positivity from 36% in the presort population to 98.76% in the sorted population. In addition, yields of CCR7+ T cells were consistently ∼50%. We also generated double biotin-labeled CCL19 to determine whether enhanced streptavidin binding might increase cell yield after sorting. As shown (Fig. 3Biii), this made no significant difference to the yield of CCR7+ cells obtained. Data from numerous bCCL19-based sorts for CCR7+ demonstrate the consistency and completeness achieved with this sorting approach (Fig. 3C). bCCL19 can be used to sort for CCR7+ human T cells. (A) Sorting method used for T cells. (B) T cells, following 11 d of in vitro culture, were stained with 250 ng/ml bCCL19 conjugated to SAPE and magnetically sorted using anti-PE microbeads. (Bi) The presort sample. (Bii) Sorted cells. (Biii) Yield of cells using single (sCCL19) and double (dCCL19) bCCL19. p = 0.568, two-tailed Student’s t test. (C) Percentage of cells labeled with bCCL19-SAPE before (presort) and after (positive fraction) sorting (n = 14). (D) Receptor recycling in T cells after incubation with bCCL19. PBMC-derived T cells were incubated with 100 ng/ml bCCL19 in duplicate. (Di) T cells stained for CD4 and CCR7 prior to incubation with bCCL19. (Dii) One aliquot of PBMC was counterstained with anti-CD4 VioBlue and anti-CCR7 allophycocyanin mAb after incubation with bCCL19. (Diii) The remaining bCCL19-bound cells were then warmed to 37°C for 60 min, washed in cold PEB, and stained with anti-CD4 and anti-CCR7, as before. Chemokines binding to their receptors induce receptor internalization, and it is possible that ligand-based sorting for CCR7+ cells may induce a CCR7− phenotype in the cells, impairing their subsequent in vivo function. However, although bCCL19 did indeed induce receptor internalization (Fig. 3Di, 3Dii), as indicated by a significant drop in cell surface CCR7 (detected using anti-CCR7 Ab) on T cells, levels were fully restored through recycling following incubation of the sorted cells in culture medium for 1 h at 37°C (Fig. 3Diii). Thus, bCCL19-SAPE is capable of highly efficient sorting of CCR7+ T cells from a mixed population. As shown (Fig. 4A), bCCL19 enriched CD4+ T cells from the mixed population to 85.85% CCR7 positivity. In keeping with CCR7 expression, the enriched population had a largely naive (bCCL19+CD62L+CD27+CD45RAhi) or central memory (bCCL19+CD62L+CD27+CD45RAlo) phenotype, with the relative representation of CCR7+ naive and central memory cells being similar to the presort population (Fig. 4Ci). For CD8+ T cells (Fig. 4B), bCCL19 enriched for more minor populations (13.44%), again displaying naive and central memory phenotypes. In contrast to CD4+ cells, sorted CD8+ T cells displayed a significantly increased proportion of naive cells compared with the presort samples (Fig. 4Cii). The relative percentages of CD4+ and CD8+ T cells were maintained postsort, suggesting that the overall spread of CCR7 expression in the presort populations is similar (Fig. 4Ciii). Human T cell sort phenotypes and in vitro migration. (A) Phenotyping of bCCL19-sorted CD4+ T cells, using CD27, CD45RA, CD62L Abs, and CCL19-SAPE. (B) Phenotyping of bCCL19-sorted CD8+ T cells, using CD27, CD45RA, CD62L Abs, and bCCL19-SAPE. For both (A) and (B), presort samples are on the left and postsort samples are on the right. (Ci and Cii) Proportion of central memory to naive phenotypes in CD4 (Ci) and CD8 (Cii) pre- and postsort cells; (Ciii) proportion of CD4 to CD8 cells in pre- and postsort samples. Results are mean ± SEM of six or seven experiments. All results were analyzed using two-tailed paired Student’s t test (**p = 0.038). To confirm functionality of sorted T cells, we compared their proliferative capacity, to that of unsorted T cells, in response to exposure to activation/expansion beads (see Materials and Methods for details), which are designed to mimic Ag presentation. Proliferation was measured using a CFSE dilution assay. 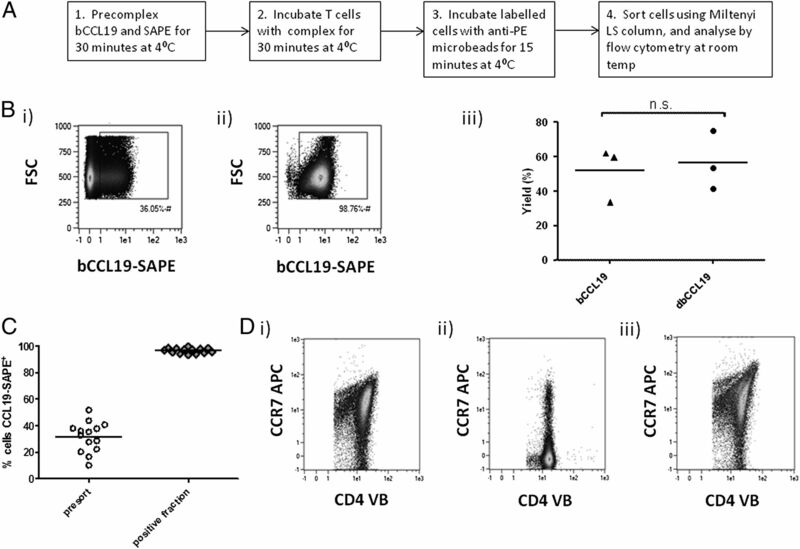 Simple incubation of T cells with bCCL19-SAPE did not affect the proliferative status of either CD4+ or CD8+ cells (compared 1 and 2 in Fig. 5A). In contrast, bCCL19-purified CCR7+ cells displayed markedly higher proliferation with both CD4+ and CD8+ cells undergoing up to five cell divisions >5 d (compare 1 and 2 with 3). Thus, bCCL19-sorted T cells are highly proliferative compared with the unsorted population, and this is likely to be a reflection of their enhanced ability to respond to Ag presentation, or equivalent stimuli, such as is represented by the use of activation/expansion beads. To demonstrate that bCCL19-sorted T cells display enhanced functional CCR7 responses, we examined their responses in migration assays. Following bCCL19-based sorting, the cells (unsorted, bCCL19− and bCCL19+) were allowed to rest overnight to restore surface CCR7 levels and then examined for migratory responses to increasing CCL19 concentrations using Transwell migration assays. As shown (Fig. 5B), bCCL19-sorted cells displayed significantly enhanced chemotaxis to CCL19 compared with either unsorted T cells or the bCCL19− population. Although not reaching significance, the bCCL19− fraction consistently displayed reduced chemotaxis toward CCL19 compared with bCCL19-stained but unsorted cells. These data demonstrate that bCCL19-sorted T cells are fully functional and display enhanced CCR7-dependent chemotaxis. bCCL19-SAPE–sorted T cells are functional. (A) Measure of proliferation of T cells using CFSE dilution assays. T cells were sorted and immediately labeled with CFSE. They were then placed in culture with IL-2 alone (20 U/ml; controls, black lines) or with activation beads plus IL-2 (red lines) and left for 5 d, following which CFSE intensity was evaluated using flow cytometry. (Ai) CD4+ T cells; (Aii) Lane 1, unsorted cells not exposed to bccl19-sape; lane 2, unsorted cells incubated with bccl19-sape for 30 min; lane 3, positive fraction from sorts. Plots are representative data from one of four separate experiments. (B) In vitro migration of sorted T cells. Migration experiments were conducted using unsorted cells that had been exposed to the bCCL19-SAPE complex (stained/unsorted, white bars); the negative fraction from the bCCL19-SAPE sorts (gray bars); and the highly purified bCCL19-SAPE+ fraction from the sorts (black bars). All results are mean ± SEM, n = 4; two-way ANOVA with Bonferroni post hoc test. *p < 0.05, ***p < 0.001. To examine the ability of bCCL19 to detect CCR7 on cells other than T cells, we generated immature and mature (CCR7-expressing) human DCs. As shown (Fig. 6A), whereas immature DCs displayed low-level bCCL19 staining (0.15%) indicative of low CCR7 positivity (Fig. 6Ai), matured DCs displayed markedly enhanced (38.06%), although variable, CCR7 positivity (Fig. 6Aii). bCCL19 staining correlated with CD83 expression, indicating that bCCL19 is specifically detecting CCR7 on mature DCs (Fig. 6Aii). Data from multiple experiments revealed the consistent ability of bCCL19 to stain for CCR7 on immature and mature DCs (Fig. 6Aiii). 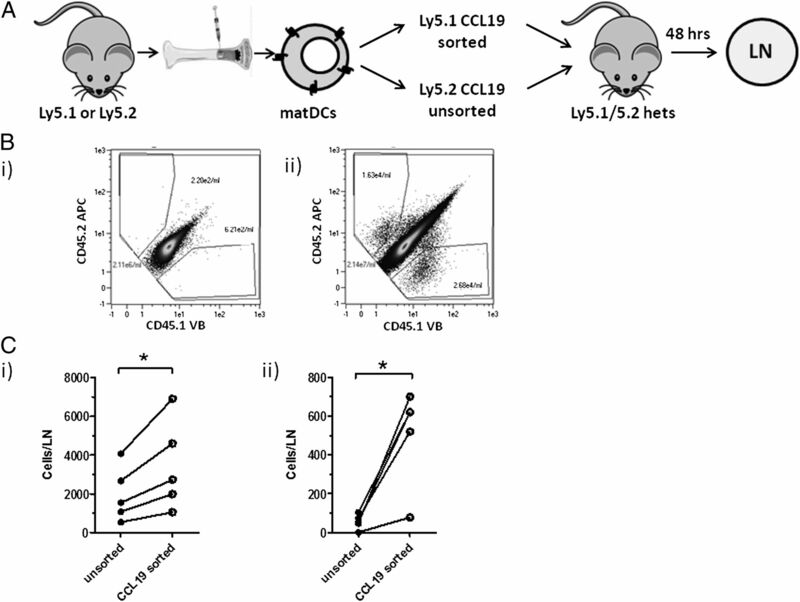 These data demonstrate that bCCL19 can detect CCR7 on monocyte-derived DCs. DC staining and sorting with bCCL19-SAPE. (A) Immature DCs were grown from CD14+ fractions of buffy coats and matured with poly(I:C)/PGE2 for 48 h. Cells were stained as in Fig. 1. (Ai) Immature DCs. (Aii) Mature DCs. (Aiii) Maturation of human monocyte-derived DC (MoDC) with poly(I:C) and PGE2 increases the percentage of cells staining positive with bCCL19-SAPE (n = 6). bCCL19-SAPE+ gates were set using SAPE controls in which <1% of cells showed positivity for SAPE. (B) bCCL19-SAPE staining of murine BM-DCs. Immature DCs were grown from murine BM in the presence of GM-CSF and matured with LPS and TNF-α for 24 h. Cells were stained using 250 ng/ml bCCL19 conjugated to SAPE. (Bi) Immature DCs. (Bii) DCs matured with LPS/TNF-α. (Biii) Percentage of cells staining positive with bCCL19 (n = 7). Gates were set as in (A). (C) Initial sorting of DCs. The percentage of cells staining positive with bCCL19-SAPE is increased from the presort sample (Ci) to the postsort sort fraction (Cii), leaving behind a negative sort fraction depleted for bCCL19+ cells (Ciii). (D) Quantitative data from comparative DC sorts. Sorting was initially performed with a single LS column. The sort was then performed using LS columns fitted with 23G needles (LS23G, dark gray bars), to slow the flow of cells through the column. After the first sort, the negative fraction of the sample was passed through a second LS23G (LS23G/LS23G, black bars) to increase the yield of positive cells from the sort. Statistics were calculated using two-way repeated-measures ANOVA with Bonferroni posttest. n = 3–4, *p < 0.05, ***p < 0.001. Next, we examined whether bCCL19 was capable of sorting CCR7+ DCs. As we wished to examine the impact of bCCL19-based CCR7 sorting on in vivo migration competence of DCs, we present data on sorting of murine BM-DCs. As shown (Fig. 6B), similar to human monocyte-derived DCs, CCL19 staining was able to distinguish between immature (Fig. 6Bi) and mature (Fig. 6Bii) BM-DCs on the basis of CCR7 positivity. In repeat experiments (Fig. 6Biii), whereas immature BM-DCs were predominantly CCR7−, mature DCs displayed ∼50% CCR7 positivity. Next, we examined the ability of bCCL19 to enrich for CCR7+ cells from mixed populations of CCR7+ and CCR7− mature DCs. As shown (Fig. 6C), whereas the overall percentage of CCR7 positivity in the presort sample was ∼23% (Fig. 6Ci), bCCL19-based sorting enriched for CCR7+ cells (to 84.44%) following magnetic bead selection (Fig. 6Cii), leaving behind a population depleted in CCR7+ cells (12.62%) (Fig. 6Ciii). In multiple experiments, we observed a high level of purity and viability of the sorted DC population. However, initial yields were <20% but could be improved by attaching a 23G needle to the outlet of the sorting column, thus reducing flow rate, and enhancing yields to >20% (Fig. 6D). Yields were further enhanced to >50% (Fig. 6D) by passing the flow-through from the initial cell enrichment through a second sorting column (again with a 23G needle attached). Thus, in addition to T cells, bCCL19 can be used to detect CCR7+ DCs and enrich for these cells using magnetic bead technology to generate clinically usable yields. As CCR7 mediates DC migration to LNs from peripheral tissues, we next examined bCCL19-sorted DCs for their LN-homing potential. The experiment outlined in Fig. 7A used DCs generated from Ly5.1 and Ly5.2 mouse BM, which were enriched for CCR7 expression using bCCL19 (Ly5.1), or left unsorted (Ly5.2). Equal numbers of the DCs were mixed and adoptively transferred into the right footpad of recipient heterozygous Ly5.1/Ly5.2 mice. Experiments using reciprocal Ly5.2-sorted/Ly5.1-unsorted DCs were also carried out. As shown (Fig. 7Bi), only Ly5.1/Ly5.2 heterozygous cells were detected in contralateral popliteal LNs; however, substantial numbers of Ly5.1+ and Ly5.2+ cells were detectable in the popliteal LN draining the injection site, against a background of Ly5.1/Ly5.2 heterozygous cells (Fig. 7Bii). As shown in two separate experiments involving reciprocal use of Ly5.1 and Ly5.2 DCs (Fig. 7Ci, 7Cii), it was observed that significantly more bCCL19-sorted DCs migrated to the draining LN than unsorted, but bCCL19-labeled, cells. The marked differences in the numbers of unsorted and sorted DCs reaching the LNs in Fig. 7Ci and 7Cii are likely to be peculiarities of the individual experiments and not a consequence of Ly5.1 or Ly5.2 contribution to DC migratory kinetics. These data confirm the functional competence of bCCL19-sorted DCs and highlight bCCL19-based sorting as a novel strategy for the isolation of DCs with enhanced LN-homing competence. In vivo homing of CCL19-sorted cells. (A) DCs were grown from BM of Ly5.1 and Ly5.2 mice. The Ly5.2 DCs were exposed to the bCCL19-SAPE complex but left unsorted, whereas the Ly5.1 DCs were sorted using the bCCL19-SAPE complex and anti-PE microbeads (Miltenyi Biotec). The sorted and unsorted cells were mixed at a ratio of 1:1 (7 × 105 cells of each cell type) in PBS + 0.5% BSA and injected into the rear right footpads of Ly5.1/Ly5.2 heterozygous mice. After 48 h, the draining popliteal LN and the contralateral popliteal LN were removed, and the cells were isolated and stained with anti-CD45.1 and anti-CD45.2 Abs. Single-stained cells were counted using the MACSQuant flow cytometer, and results expressed as cells per LN. The reciprocal experiment in which Ly5.1 cells were unsorted and Ly5.2 cells were sorted was also performed. (B) Representative flow cytometry plots of draining popliteal LN from the experiment. (Bi) A contralateral popliteal LN. (Bii) A draining popliteal LN from the sorted Ly5.1 experiment. (C) Number of transferred cells per LN: bCCL19-sorted cells (open circles) and unsorted cells (closed circles) were mixed at a ratio of 1:1 and transferred into recipient footpads. (Ci) Ly5.1 sorted versus Ly5.2 unsorted; (Cii) Ly5.2 sorted and Ly5.1 unsorted. All results are mean ± SEM, and statistical significance was determined using two-tailed paired Student’s t test. *p < 0.05. The ability to preselect therapeutic cell populations, on the basis of chemokine receptor expression, would improve their ability to home to specific therapeutic niches and lead to marked enhancements in therapeutic efficacy. This is clear in the context of DC migration to LNs for immune-initiating therapeutic function (13, 16) but is also relevant to selection of cells for homing to BM (37), skin (38), gut (39), or indeed any site for which chemokine-homing receptors are known. Unfortunately, the relative lack of high-quality Abs to chemokine receptors means that simple immune-based selection for chemokine receptor-bearing cells is not always possible. In addition, Abs are expensive and invariably species specific. In this study, we describe a novel use of chemokines as versatile reagents capable of detecting, and sorting for, specific chemokine receptor-bearing cells. The advantages of chemokines over Abs in this context are as follows: 1) they are relatively inexpensive to produce in high quantity and high purity by chemical synthesis; 2) they can cross species and are amenable to detection of orthologous receptors in multiple species; 3) they are adaptable for good manufacturing practice–grade therapeutic use. Specifically, we show that bCCL19 can detect CCR7 on T cells, and DCs sort these cells on this basis. The enriched CCR7+ T cells and DCs are fully functional and, as would be anticipated, bCCL19-enriched DCs display enhanced LN migration competence. This has implications for DC therapy and suggests that preselection of cells using bCCL19 would provide a fitter cell product with enhanced LN migration competence. In addition, it would deplete immature DCs within the therapeutic population that may otherwise induce tolerance to therapeutic Ags (20, 21). With regard to the therapeutic use of T cells, both natural (40) and artificially transduced Ag-specific T cell therapies (41) use CCR7+ naive and central memory T cells. These cells possess the ability to repopulate both central and effector immunity niches, leading to elaboration of full immune responses upon adoptive transfer. Conversely, CCR7− effector clones could not fully repopulate immune responses against CMV (40). We have shown that bCCL19 makes an excellent sorting agent for isolating fully functional naive and central memory T cells. Thus, isolating T cells in this manner has direct applicability to developing clinical protocols in which CCR7+ T cells will be applied. The ability to produce biotinylated chemokines through chemical synthesis means that chemokines relevant in other cell-homing contexts can, in principle, be used in cell-sorting applications. One example of this is the potential use of biotinylated CXCL12 for detecting and isolating BM-homing haemopoietic stem cell populations (37, 42–45). We have demonstrated the utility of biotinylated CXCL12 for CXCR4 detection on BM cells. To attempt to provide an initial assessment of clinical utility, we tried using biotinylated CXCL12 to measure stem cell mobilization to peripheral blood following G-CSF administration in mice. However, in this context, the biotinylated CXCL12 could not detect CXCR4 on the mobilized cells perhaps as a result of the reported downregulation of CXCR4 upon G-CSF mobilization of stem cells (46). Importantly, this does not preclude clinical utility in other contexts. All secondary reagents involved in the use of biotinylated chemokines for flow cytometry and cell sorting are commercially available and adaptable for immediate use with any biotinylated chemokine. In addition, all secondary reagents used for cell sorting in this study have been developed for good manufacturing practice–grade use. Accordingly, the use of biotinylated chemokines as cell-sorting agents in a range of clinical contexts is feasible using currently available reagents and technologies. In summary, we provide evidence demonstrating a novel use for chemokines as reagents for identifying, and isolating, cells bearing their cognate receptors. In this context, biotinylated chemokines have important therapeutic potential and are also likely to prove useful in a variety of experimental and veterinary contexts. This work was supported by grants from the Medical Research Council and the Scottish Chief Scientist's Office. Copyright © 2014 by The American Association of Immunologists, Inc.
. 2004. Chemokines in innate and adaptive host defense: basic chemokinese grammar for immune cells. Annu. Rev. Immunol. 22: 891–928.
. 2000. Chemokines: a new classification system and their role in immunity. Immunity 12: 121–127.
. 2006. The chemokine and chemokine receptor superfamilies and their molecular evolution. Genome Biol. 7: 243.
. 2000. International union of pharmacology. XXII. Nomenclature for chemokine receptors. Pharmacol. Rev. 52: 145–176. 1999. The chemokine system: redundancy for robust outputs. Immunol. Today 20: 254–257.
. 2005. A stromal address code defined by fibroblasts. Trends Immunol. 26: 150–156.
. 2010. Enhancing the outcome of cell therapy for cardiac repair: progress from bench to bedside and back. Circulation 121: 325–335.
. 2012. Journey of mesenchymal stem cells for homing: strategies to enhance efficacy and safety of stem cell therapy. Stem Cells Int. DOI: 10.1155/2012/342968.
. 2012. Enhanced homing permeability and retention of bone marrow stromal cells by noninvasive pulsed focused ultrasound. Stem Cells 30: 1216–1227.
. 2009. Neural stem cell niches and homing: recruitment and integration into functional tissues. ILAR J. 51: 3–23.
. 2005. Chemokine receptor CCR7 guides T cell exit from peripheral tissues and entry into afferent lymphatics. Nat. Immunol. 6: 895–901.
. 2005. Chemokine receptor CCR7 required for T lymphocyte exit from peripheral tissues. Nat. Immunol. 6: 889–894.
. 2008. CCR7 and its ligands: balancing immunity and tolerance. Nat. Rev. Immunol. 8: 362–371.
. 1999. CCR7 coordinates the primary immune response by establishing functional microenvironments in secondary lymphoid organs. Cell 99: 23–33.
. 2011. Afferent lymph-derived T cells and DCs use different chemokine receptor CCR7-dependent routes for entry into the lymph node and intranodal migration. Nat. Immunol. 12: 879–887.
. 2012. Lymph node homing of T cells and dendritic cells via afferent lymphatics. Trends Immunol. 33: 271–280.
. 1998. Rapid and coordinated switch in chemokine receptor expression during dendritic cell maturation. Eur. J. Immunol. 28: 2760–2769.
. 1998. Differential regulation of chemokine receptors during dendritic cell maturation: a model for their trafficking properties. J. Immunol. 161: 1083–1086.
. 2004. 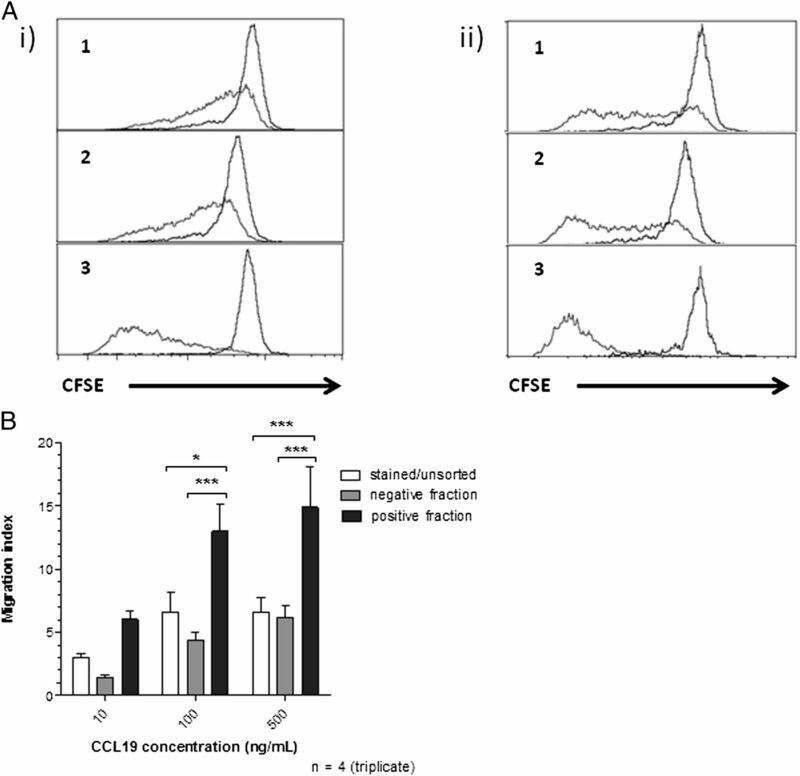 Analysis of the CCR7 expression on murine bone marrow-derived and spleen dendritic cells. J. Leukoc. Biol. 76: 472–476.
. 2010. Development of dendritic cell-based immunotherapy for autoimmunity. Int. Rev. Immunol. 29: 156–183.
. 2001. A comparison of two types of dendritic cell as adjuvants for the induction of melanoma-specific T-cell responses in humans following intranodal injection. Int. J. Cancer 93: 243–251.
. 2011. Route of administration modulates the induction of dendritic cell vaccine-induced antigen-specific T cells in advanced melanoma patients. Clin. Cancer Res. 17: 5725–5735.
. 2005. Augmentation of the migratory ability of DC-based vaccine into regional lymph nodes by efficient CCR7 gene transduction. Gene Ther. 12: 129–139.
. 2012. Engineering lymph node homing of ex vivo-expanded human natural killer cells via trogocytosis of the chemokine receptor CCR7. Blood 119: 5164–5172.
. 2001. Suppression of IL-2-induced T cell proliferation and phosphorylation of STAT3 and STAT5 by tumor-derived TGF beta is reversed by IL-15. J. Immunol. 167: 553–561.
. 2005. Isolation and generation of clinical-grade dendritic cells using the CliniMACS system. Methods Mol. Med. 109: 55–70.
. 2002. 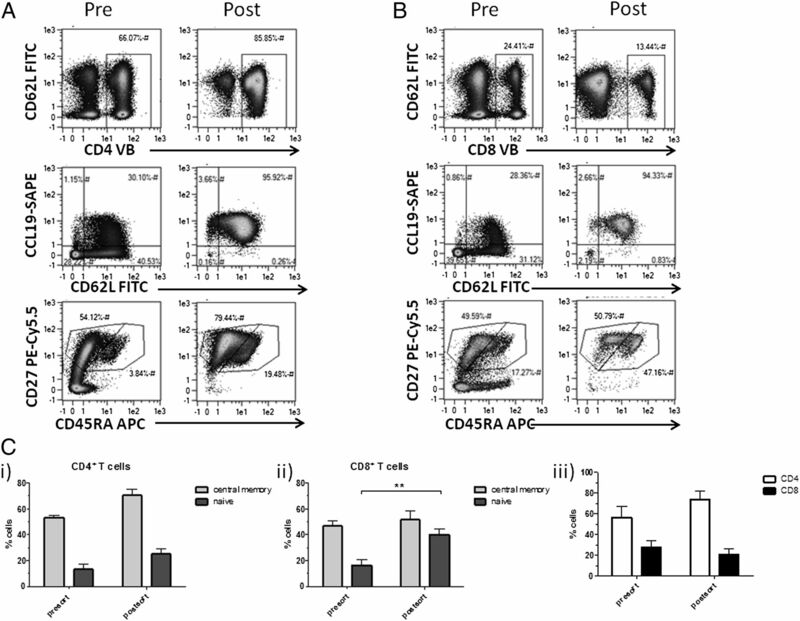 Prostaglandin E2 is a key factor for CCR7 surface expression and migration of monocyte-derived dendritic cells. Blood 100: 1354–1361.
. 2013. An analysis of the function and expression of D6 on lymphatic endothelial cells. Blood 121: 3768–3777.
. 1997. Cloning and characterization of a novel murine beta chemokine receptor, D6: comparison to three other related macrophage inflammatory protein-1alpha receptors, CCR-1, CCR-3, and CCR-5. J. Biol. Chem. 272: 12495–12504.
. 1997. Cloning and characterization of a novel promiscuous human beta-chemokine receptor D6. J. Biol. Chem. 272: 32078–32083.
. 2006. The chemokine receptor CCX-CKR mediates effective scavenging of CCL19 in vitro. Eur. J. Immunol. 36: 1904–1916.
. 2011. Universal expression and dual function of the atypical chemokine receptor D6 on innate-like B cells in mice. Blood 117: 5413–5424.
. 2004. The chemokine receptor D6 constitutively traffics to and from the cell surface to internalize and degrade chemokines. Mol. Biol. Cell 15: 2492–2508.
. 1999. Quantitative analysis of lymphocyte differentiation and proliferation in vitro using carboxyfluorescein diacetate succinimidyl ester. Immunol. Cell Biol. 77: 516–522. 2009. D6 and the atypical chemokine receptor family: novel regulators of immune and inflammatory processes. Eur. J. Immunol. 39: 342–351.
. 2007. Disrupted cardiac development but normal hematopoiesis in mice deficient in the second CXCL12/SDF-1 receptor, CXCR7. Proc. Natl. Acad. Sci. USA 104: 14759–14764.
. 2005. How do stem cells find their way home? Blood 106: 1901–1910.
. 2002. CCL27-CCR10 interactions regulate T cell-mediated skin inflammation. Nat. Med. 8: 157–165.
. 2004. Chemokine receptor CCR9 contributes to the localization of plasma cells to the small intestine. J. Exp. Med. 199: 411–416.
. 2008. Adoptive transfer of effector CD8+ T cells derived from central memory cells establishes persistent T cell memory in primates. J. Clin. Invest. 118: 294–305.
. 2012. T cells engineered with a T cell receptor against the prostate antigen TARP specifically kill HLA-A2+ prostate and breast cancer cells. Proc. Natl. Acad. Sci. USA 109: 15877–15881.
. 2002. Current understanding of stem cell mobilization: the roles of chemokines, proteolytic enzymes, adhesion molecules, cytokines, and stromal cells. Exp. Hematol. 30: 973–981.
. 2006. Hemopoietic stem cell engraftment. Exp. Hematol. 34: 123–129.
. 1999. Homing and mobilization in the stem cell niche. Trends Cell Biol. 9: 233–238.
. 2006. Mechanisms of hematopoietic stem cell mobilization: when innate immunity assails the cells that make blood and bone. Exp. Hematol. 34: 996–1009.
. 2002. G-CSF induces stem cell mobilization by decreasing bone marrow SDF-1 and up-regulating CXCR4. Nat. Immunol. 3: 687–694.